1. 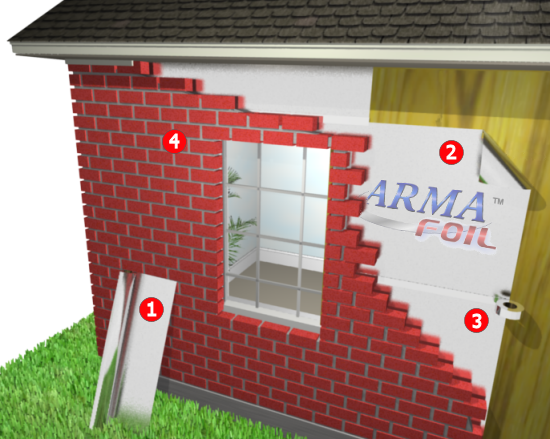 You must use a Perforated Radiant Barrier material (ARMA FOIL™) for this job. 2. Unroll the radiant barrier and staple it to the exterior side of the wall sheathing. Staples should be spaced around 12 to 18 inches. Start at the bottom and work your way up the wall, overlaping each run by 2 to 4 inches. 3. Use our Foil Tape to tape over all seams and around all penetrations. Tape helps to seal the loose ends and reduces air infiltration. 4. Apply your exterior veneer (brick or siding) as usual. If using an unlapped board siding, you may need to install a minimum of 0.5 inch furring strips to create the air space. Important Note: An air space is required on at least one side of the reflective radiant barrier house wrap material to benefit from the heat reflective insulating properties.